Out of the six different options presented, telling someone in person is viewed as the most socially acceptable way of breaking up with someone by a wide margin – teens give this an average of 8.4 points on a 1-10 acceptability scale, and 78% rate it an 8 or higher. Breaking up with someone over the telephone is the second-most acceptable approach, although teens consider this a much less acceptable method than telling someone in person. 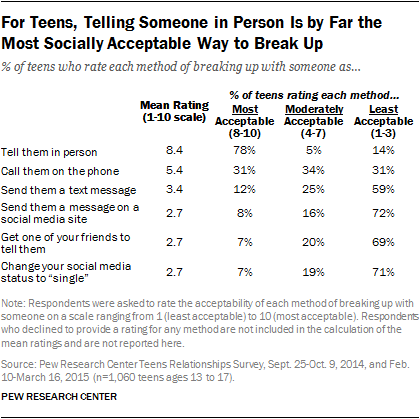 Breaking up over the phone receives an average rating of 5.4 points, with 31% of teens rating it as an 8 or higher. As its comparably lower rating indicates, a substantial minority of teens find breaking up via phone call to be highly unacceptable, as 31% rate it as a 3 or lower on the 1-10 scale. Sending them a text message: This receives an average rating of 3.4 points on a 1-10 scale, with just 12% of teens rating it an 8 or higher and 59% rating it a 3 or lower. Sending them a message on a social media site: This receives an average of 2.7 points, with 8% rating it an 8 or higher and 72% rating it a 3 or lower. Getting a friend to tell them for you: This receives an average of 2.7 points, with 7% rating it an 8 or higher and 69% rating it a 3 or lower. Changing your status to single on a social media site: This receives an average of 2.7 points, with 7% rating it an 8 or higher and 71% rating it a 3 or lower. Teens of all stripes (boys and girls, older teens and younger teens, whites and non-whites, those with relationship experience and those without, among others) rank these approaches in a nearly identical manner. 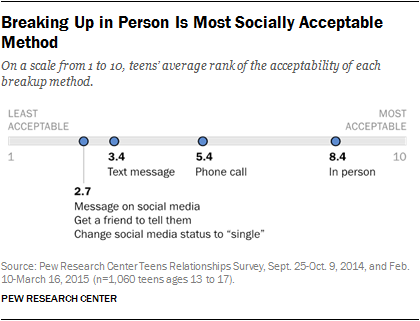 Regardless of their demographic or other characteristics, teens view an in-person conversation as the most socially acceptable way of breaking up with someone (in every instance by a substantial margin); they view calling someone on the telephone as moderately acceptable; and they say breaking up via text message, social media or through a personal intermediary is generally unacceptable. Along with asking all teens (regardless of whether they have been in a romantic relationship) about the social acceptability of various ways of breaking up with someone, the survey also asked teens with romantic relationship experience about ways in which they have broken up with someone, as well as ways in which a partner has broken up with them. In certain ways, these reported real-world experiences line up with teens’ general attitudes about the most socially appropriate ways to break up with someone. For example, having an in-person conversation is viewed as the most generally acceptable way to break up with someone, and these conversations are the most common way that breakups occur in a “real-world” setting. Some 62% of teens with relationship experience have broken up with someone in person, and 47% have been broken up with through an in-person discussion. Similarly, phone call conversations (which are seen as the second-most acceptable way of breaking up with someone) are relatively common: 29% of teens with relationship experience have broken up with someone over the phone, and 27% have been broken up with in this way. And at the other end of the spectrum, breakups through social media (which are viewed as having low levels of acceptability) are quite uncommon—fewer than one-in-ten teens with dating experience have experienced or initiated a breakup by sending a private social media message, changing their relationship status on Facebook or posting a status update. At the same time, text messaging – which is widely viewed as one of the least acceptable ways of breaking up with someone – is more common in the context of actual relationships than its perceived acceptability might indicate. Some 27% of teens with relationship experience have broken up with someone via text message, 31% have been broken up with in this way. That makes text message breakups as common as voice call breakups – even though voice calls are viewed as much more socially acceptable. Finally, many relationships go out not with a bang but with a whimper – some 15% of teens with relationship experience have experienced a breakup that never ended formally, but “just drifted away.” Indeed, teens are more likely to experience this type of breakup than to experience any of the other options mentioned in the survey outside of in-person talks, voice calls and text messaging. Overall, there are only modest differences between different groups of teens when it comes to their experiences with breakups. Girls are a bit more likely than boys to say they have broken up with someone by sending them a private message on a social network site (10% of girls with relationship experience have done so, compared with 2% of boys), and teens ages 13 and 14 are a bit more likely than older teens to have broken up with someone by posting a status update (9% vs. 2%) or posting an image (4% vs. less than 1%). There are also modest differences along socioeconomic lines. Teens from households with an annual income of less than $50,000 are more likely than those from higher-income households to say they have broken up with someone by text message (39% vs. 22%) as well as by changing their relationship status on Facebook (15% vs. 2%). They also are more likely to say someone has broken up with them via a private message on a social networking site (13% vs. 3%). For teens who experience and document the history of their romantic relationships through social media and mobile devices, the end of those relationships can leave behind a trail of digital memories in the form of messages and photos scattered across multiple platforms or the name of an ex in a cellphone address book. These digital platforms also can offer a way for exes to initiate potentially unwanted contact, or simply serve as a visible reminder of a connection that no longer exists in person. 48% have removed someone they used to date from their cellphone’s address book. 38% have untagged or deleted photos of themselves and a past partner on social media. 30% have blocked an ex from texting them. Girls are substantially more likely than boys to take these steps in the context of social media. Some 44% of girls with relationship experience have blocked or unfriended an ex on social media (compared with 31% of boys), while 46% girls have untagged or deleted photos from a previous relationship (compared with 30% of boys). By contrast, there are no gender differences when it comes to relationship pruning on cellphones – girls and boys are equally likely to have removed an ex from their phone contacts list (48% of boys and 47% of girls have done so), and to have blocked a previous partner from texting them (29% for boys, 32% for girls). Beyond these gender differences pertaining to social media, there are few other demographic differences when it comes to pruning past relationships on social media or cellphones. Despite some of the challenges outlined above, a majority of teen daters view social media as a supportive place in the context of relationship breakups. Some 63% of teen social media users with relationship experience agree with the statement that “social media allows people to support you when a relationship ends,” although just 8% agree with the statement strongly. At the same time, a substantial minority of teens do not view social media as a supportive place. Some 37% disagree with the notion that social media allows people to support them when a relationship ends, although again most do not have especially strong views – just 3% “strongly disagree” with this statement. 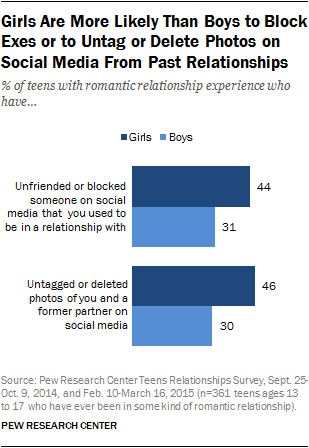 As noted above, girls are more likely than boys to take an active role in pruning photos from past relationships, and to block or unfriend exes. Yet boys and girls have identical views on whether social media offers a place for others to support them in the context of a romantic breakup. For teens who document the course of their romantic relationships on social media, that documentation might make it more challenging to forget about past relationships when those relationships end. However, teens themselves are nearly evenly divided on the impact of social media when it comes to forgetting about past significant others. Some 47% of teens with relationship experience who use social media agree with the following statement: “You can’t escape people you used to date because you still see them in photos and posts on social media,” with 8% agreeing strongly. At the same time 53% of these teens disagree with this statement, 7% of them doing so strongly. Teens of various demographic groups are divided on this question – boys and girls, younger and older teens, and lower- and higher-income teens are all evenly split on this question.